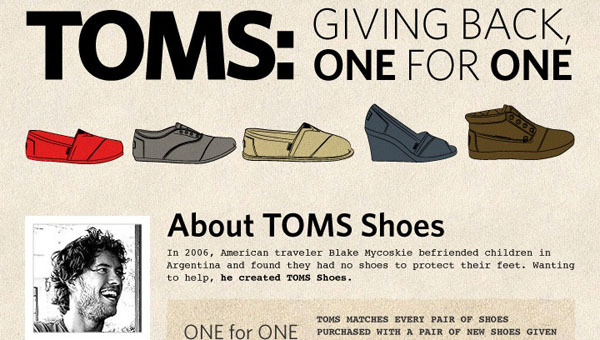 This infographic gives some background about the lack of footwear and visual impairment problems that exist in developing nations, and the TOMS program that, through numerous partnerships, is working towards solving these problems. First and foremost, it is a good cause, and recognizing the efforts of charitable individuals is important for encouraging future contributory works. The red shoe works as the unit of choice here, and make the visually represented statistics accurate and impressive. The coloring of the infographic is, in general, a bit drab, but overall works well enough for its purpose. The message isn’t about flash, anyway. While I appreciate the work in addressing visual impairment, I found it strange to tack it on here. I understand they are trying to get the most out of the infographic in spreading their message, but I expected the whole thing to be about shoes. Just seemed a bit greedy with my attention. I also could have done with a few more statistics early on, about the kinds of problems that a lack of footwear creates. If it’s going to be an infographic driven by stats, give me more. Owning shoes increases attendance. By how much? This entry was posted on January 30, 2012, 6:21 pm and is filed under Society & Culture. You can follow any responses to this entry through RSS 2.0. You can leave a response, or trackback from your own site.